Help!! It's the Breakfast Menu Police! It always frustrates me when a restaurant or fast food outlet only allows customers to order food from their "Breakfast Menu" before a certain time. Traditional breakfast fare is naturally unsatisfying and disappointing, but this is not the point; I've no issue with restaurants having a Breakfast Menu, for those who like eating such food. However, if I feel hungry at half-past-nine in the morning, and I want to order pie'n'chips, or spaghetti carbonara, or a four cheese pizza, then I should damn well be allowed to! And who are Wetherspoons, or McDonalds, or anyone else, to tell me otherwise?! A few short weeks ago, I wrote about the Olympic Games - I described how I believed that London 2012 would be a great event, and a very momentous occasion for Great Britain, and I expressed my hopes that the cynics and the grumblers would give it a rest for the next couple of weeks. And I was right - the Games have been a triumph, and (for the most part, at least) the resentment and the scoffing has turned into genuine admiration and praise for these very special two weeks. The International Olympic Committee has heaped praise upon LOCOG, the city of London, and the people of Great Britain as a whole. If I'm honest, I'm very sad that, by the end of today, it's all going to be over. But what makes me saddest, is that I never got to be a part of it all. I have loved watching the Olympics on television. The BBC Olympics coverage has been second-to-none, and they have received many (richly-deserved) accolades for the quality of broadcasting. I have been amazed and delighted by the success of Team GB - such an enormous haul of Medals at a home Games, and third place in the Medals Table, is quite astonishing, and an extraordinary achievement which is testimony in itself to the quality of the sportsmen and women we, as a nation, have produced. (Not to mention our "behind the scenes" teams of coaches, trainers, nutritionists, organisers, promoters, and so on.) I am proud of every single one of them. But this all combines to make this particular Olympic Games (the Games of the 30th Olympiad) all the more unique - and this, in turn, makes me even sadder not to have been involved at all. It quickly became apparent that the 2012 Olympic Games would be the defining event of this generation. It is something which will be talked about, for years to come. It is something which people will look back on, and remember fondly. My memories of it will mainly involve sitting on a variety of sofas, watching a variety of television screens. When people ask in the future "what did you do at London 2012?" or "what events did you go to at London 2012?" I will have nothing to say. Not through a lack of trying. Initially, I applied to be a Games Maker (one of the volunteers who did all the jobs which a huge undertaking such as the Olympics requires) and, although I got invited to the interview procedure in London, and made it through that, I never actually got offered a volunteer rôle. After that, I tried, multiple times, to apply for tickets, so that I could at least go to an event, see the Games in action, and soak up the atmosphere. But I never quite managed to find anything - all the tickets were snapped up within seconds of their being posted online, and the London 2012 Ticketing website was set out in a confusing and convoluted way. There will be other Olympics. Of course there will - the Games will be in Rio in 2016, as we know, and after that, goodness knows where else! And there will be other big sporting events happening in Britain. (The BBC presenters have often alluded to the Commonwealth Games in Glasgow in 2014 during the coverage of the London Olympics.) But that isn't the same, is it? I'm sure that going to Glasgow or Rio would be fantastic - as would many, many other things - but London 2012 is gone, and that special, unique feeling of having something so wonderfully all-encompassing as the Olympic Games here in Great Britain is unlikely to come around again for a long, long time. I honestly feel like I have missed out on a once-in-a-lifetime experience - and, much as I have enjoyed every moment of the Olympics, I will always regret that I never truly got to be a part of it. #Olympics: what is a sport? D'you know what's really irritated me over the past week or two? People watching the 2012 Olympics Games in London, and then going online to comment on how such-and-such an Olympic event "is not a sport", or "shouldn't even be in the Olympics". What qualifies these people to decide what is, or is not, a "sport"? Presumably, they think that they know more than the International Olympic Committee... But, more importantly, what does it matter? The Olympics is about people being the best they can be. The Olympic Motto - Citius, Altius, Fortius (Latin for "Higher, Faster, Stronger") - bears that out. The Olympics is a chance to celebrate what is possible. Olympians train for years - often their whole lives - in whichever discipline they have chosen. They make huge sacrifices, and they push themselves to the limits - physically, psychologically and emotionally. This is what the Olympics is really all about: people, being brilliant. What right have you to dismiss the achievements of others? To win an Olympic medal - of any colour, at any sport, or discipline - is a huge accomplishment, and you can bet it's taken a huge amount of effort to get there. Why try to cheapen this incredible feat, with a cursory wave of the hand, and a derisive snort of "ohh, but that's not a real sport..."? Maybe, one day, you too might set out to achieve something. It might take years to get there. It might mean making sacrifices. It will almost certainly mean many, many hours of training, working hard, perfecting your craft - often early in the morning, or late into the night. But you will persevere, because it is something which means a lot to you; something about which you are passionate. And, when you eventually get there, and your brain floods with emotions of relief and elation that you finally made it, that you realised your hopes and dreams of so long, how will you feel when that accomplishment is degraded by others who haven't been through what you have, telling you that it isn't worth anything? What is this phrase "pre-order", which has become so common just recently? The trouble is, it's utter rubbish - the phrase doesn't actually mean anything! The prefix "pre-" refers to something being done in advance (for example, "premediated", "predetermined" or "preconceived") but one can only ever order a product in advance of receiving it, making the "pre-" completely superfluous. "Pre-planned means you gave an event or project thought ahead of time." That's exactly what the word "planned" means. How is "pre-planning" something any different from just planning it? 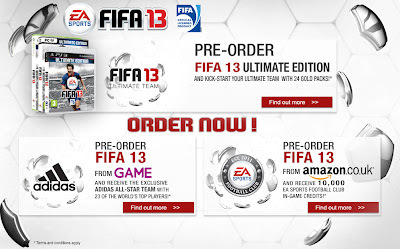 How is "pre-ordering" Fifa 13 any different from simply ordering it? It isn't; there's no difference. The "pre-" is unnecessary. STOP ADDING IT IN WHERE IT'S NOT NEEDED.